Update 2017 Feb 25: I have updated the step-by-step instructions based on the suggested fixes and improvements contained in the reader comments. I also have copied the step-by-step instructions from this blog post to the README.md file hosted on https://github.com/michaelfranzl/rpi23-gen-image. From now on I will update the instructions only on github, so expect that the instructions in this blog post will grow slightly out of date. Update 2017 Mar 4: 64 bit kernel and Debian OS now works on the RPi3. This has been a long way coming. In February 2014, Broadcom announced that they would release the formerly closed-source drivers for the VideoCore IV (VC4) GPU of their BCM283x family of System-on-a-chip (SoC), powering Raspberry Pi’s. 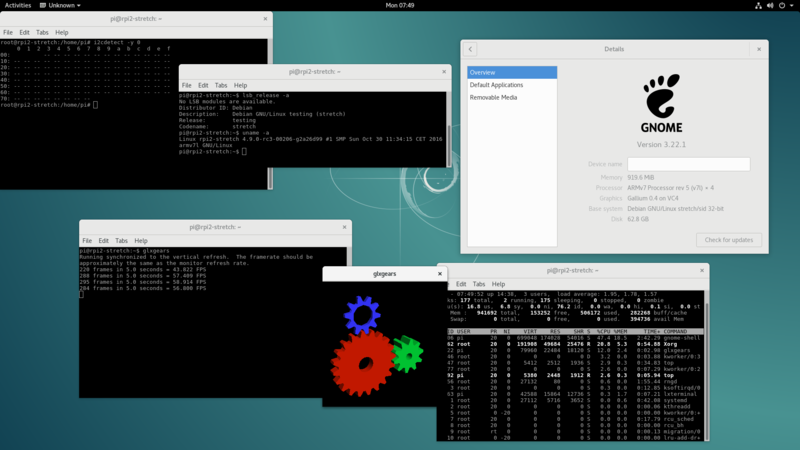 Debian 9 (“Stretch”) running on my Raspberry Pi 2 (and 3), powered by Linux 4.9.0-rc3 Mainline/Vanilla Kernel. Notable in this image: Graphics driver is recognized as “Gallium” running on the VC4 GPU of the Broadcom 2836 system-on-a-chip (SOC). The glxgears benchmark runs with 60 FPS (the vsync of the monitor) and consumes very little CPU. Even the Raspberry I2C interface is recognized by the Linux Mainline Kernel. To emphasize the point: It is no longer necessary to run specialized distributions (like Raspbian) or Linux kernels (like the Raspbian flavor) in order to have the Raspberry Pi well supported. And this is good news. Debian is a well established and maintained standard Distribution. And even though the Raspberry Pi is not powerful enough for the professional desktop user, it is powerful enough for the casual desktop user, and it is very small and cheap, which opens up a whole lot of possibities for new real-world applications. It still is not a matter of a one-click installer to reproduce these results, you need some experience when you run into barriers. But it has gotten a whole lot easier. Github user drtyhlpr thankfully published the script rpi23-gen-image that can create a standard Debian distribution for the Raspberry Pi that can simply be copied to a SD card. Only official Debian releases 9 (“Stretch”) and newer are supported. Only the official/mainline/vanilla Linux kernel is supported (not the raspberry flavor kernel). The Linux kernel must be pre-cross-compiled on the PC running this script (instructions below). Only U-Boot booting is supported. The U-Boot sources must be pre-downloaded and pre-cross-compiled on the PC running this script (instructions below). An apt caching proxy server must be installed to save bandwidth (instructions below). The installation of the system to an SD card is done by simple copying or rsyncing, rather than creating, shrinking and expanding file system images. The FBTURBO option is removed in favor or the working VC4 OpenGL drivers of the mainline Linux kernel. The newer RPi3 (setting RPI_MODEL=3) is supported too. It will run the arm64 architecture of Debian, and a 64-bit kernel. The support of this board by the Linux kernel will very likely improve over time. In general, this script is EXPERIMENTAL. I do not provide ISO file system images. It is better to master the process rather than to rely on precompiled images. In this sense, use this project only for educational purposes. Basically, we will deboostrap a minimal Debian 9 (“Stretch”) system for the Raspberry on a regular PC running also Debian 9 (“Stretch”). Then we copy that system onto a SD card, then boot it on the Raspberry. Do the following steps as root user. This way, you won’t have to re-download hundreds of megabytes of Debian packages from the Debian server every time you run the rpi23-gen-image script. The following list of Debian packages must be installed on the build system because they are essentially required for the bootstrapping process. Working configuration files for this Linux kernel revision are included in this repository. (working-rpi2-linux-config.txt and working-rpi3-linux-config.txt). Verify that you have the required kernel image. This is where you call the rpi23-gen-image.sh script. You may want to modify the variables according to the section “Command-line parameters” below. The file example.sh in my github repostory contains a working example. Note about SD cards: Cheap (or sometimes even professional) SD cards can be weird at times. I’ve repeatedly noticed corrupt/truncated files even after proper rsync and proper umount on different brand new SD cards. TODO: Add a method to verify all file checksums after rsync. Insert the SD card into the Raspberry Pi, and if everything went well, you should see a console-based login prompt on the screen. Login with the login details you’ve passed into the script (USER_NAME and PASSWORD). Remember to change usernames, passwords, and SSH keys! Running top shows that the freshly booted system uses only 23 MB out of the availabl 1GB RAM! Confirmed for both RPi2 and RPi3. The Raspberry doesn’t have a real time clock. But the default systemd conveniently syncs time from the network. Check the output of timedatectl. Confirmed working for both RPi2 and RPi3. The working device node is available at /dev/hwrng. Confirmed working for both RPi2 and RPi3. Confirmed working for both RPi2 and RPi3. As of the kernel revision referenced above, this only works on the RPi2. The RPi3 has only the red PWR LED on all the time, but otherwise is working fine. By default, the green onboard LED of the RPi blinks in a heartbeat pattern according to the system load (this is done by kernel feature LEDS_TRIGGER_HEARTBEAT). Successfully tested on the RPi2 and RPI3. If you want to install a graphical user interface, I would suggest the light-weight LXDE window manager. Gnome is still too massive to run even on a GPU-accelerated Raspberry. Reboot, and you should be greeted by the LightDM greeter screen! Only successfully tested on the RPi2. Not yet tested on the RPI3. Will this work on a Raspberry Pi 3? I don’t know, but I believe the chances are very good. If you try it out, maybe leave a comment here! section. I added device-tree-compiler to the following line. I added the following lines to /etc/rc.local to disable the red LED and change the green LED to flash when writing to the SD card. I tested on a RPi3 and it works. However, the screen is blank and only the red PWR led is on, like you described. That could be fixed via kernel configuration, which I yet have to test. But I can log in via SSH, and at least the Ethernet interface, I2C bus and USB works. Hi folks, i used Debian Stretch as the build host and it worked for me after changing ‘linux-compiler-gcc-5-arm’ to ‘linux-compiler-gcc-6-arm’ (+ also added device-tree-compiler). Yes, they changed the version recently. Thanks for pointing this out! No, it’s better if you test the step-by-step instructions yourself, and if you discover any problems, report them. Built the image according to instructions using your working kernel config for rpi3. btw: adding CONFIG_SYS_BOOTM_LEN=16000000 to u-boot/configs/rpi_3_defconfig followed by re-build did not help. I actually could reproduce your issue on my RPi3. But increasing CONFIG_SYS_BOOTM_LENGTH to 64 MB does work. I updated the instructions above, and the README of the github repository. Don’t forget to run make clean before you recompile u-boot. It should work then. This solved the booting issue ! http://ftp.debian.org/debian/dists/stretch/main/binary-arm64/Packages is incorrect as th directory Packages is missing. My rpi3 now boots. Yeah ! It seems the variables for installing xfce directly into the image are ignored, i cant find any reference to xfce in the build.log and no xfce is present once booting the pi. The same is true for console keyboard config, the locale is not generated and the keyboard is not set even though i have included the mentioned settings. Thats a minor issue though. Second and more seriously, once installing xfce and logging into the graphical interface the pi soon locks up hard, opening one or two windows is sufficient to break it. Any suggestions for issue 2 ? I took out all desktop environment options from the script to keep everything minimal and simple. Installation of a desktop environment should be done manually – see “Install GUI” section above. As to the hangups after any window is opened in XFCE, I experienced the same on both RPi2 and RPi3. I haven’t investigated what causes it, but I unplugged and re-plugged the USB keyboard and that seemed to fix it. It became responsive after about 10 seconds. It could be unrelated to USB though. If you find a fix, let me know it. So this is not happening in the other desktop environments ? You need a kernel configuration file, without extra modules, but with all the required extensions. On other sites it is advised to take as a basis the settings from rpi2. Can you adapt and post it here? I apologize, my mistake, everything is compiled. The provided kernel configuration is certainly only a proof of concept with room for optimizations. As soon as the vc4 drm gets initialized, the screen turns black. (using the composite out). I changed the kernel configuration to compile vc4 as a module and console stays available until I insmod “vc4”. I cannot verify if HDMI is working at the moment. Any idea? I have only tried with standard HDMI cable, I cannot help you with this. Work on full support of the Rasberries by the mainline Linux kernel is still going on as far as I know. I just got done with the instructions and I can ssh into the pi (RPi2), but I believe I’m hitting the same issue as you. I’ve tried with both the composite and HDMI and suffer the same result. I don’t have any useful feedback at this point, but I did want to add another data point to the bug. If you’ve found a solution, please post back. “W: Failure while configuring base packages. This will be re-attempted up to five times. Looks like bad internet connection for you, or some other problem with apt. This is not specific to Raspberry Pi. Thanks for your quick comment, Mr. Franzl. The generation was done successfully. Thank you for the great instructions and the script. Debian is my operating system distribution of choice since 1995 (Linux since 1993, first TAMU Linux followed by SLS and Slackware). I got a Raspberry Pi 2 one or two years ago, but did not do much with it yet (using Raspbian so far). Second, after copying the files to the SD card, u-boot.bin will not load anything further from the SD card, but it instead insists on booting via BOOTP and TFTP. This is obviously a dead end, because I only have a DHCP server running. This happens both with the confirmed working revision and with the newest one (commit 08546df976b79b1694af3ff12b26baf2931f371a). Which files could I check to make it work? Regarding the –allow-unauthenticated switch, this seems to be specific to your host system. It should not be needed. Regarding u-boot not loading the kernel, you should attach a monitor and keyboard to the Raspberry Pi and go into the u-boot interactive console, and try to boot manually to find out the problem. Probably something simple like a wrong filename. For some reason, some files in /boot/firmware/ had been omitted from the SD card. After adding those, the kernel will be loaded. The next problem is that the network interface is not available. I am using Linux 4.11.7, and about 9 seconds into the booting, the LEDs on the Ethernet interface will light up, and a kernel message tells that eth0 was renamed into something. “ifup” does not recognize that string, and no IPv4 networking is working. I am not familiar enough with systemd to troubleshoot this, but I suspect that it could be some problem with the userspace. The hardware should be OK, because when the files were missing U-boot did get a DHCP reply from the router. According to the log files, there were some problems with some core package depencies. I finally solved the problem by “debootstrap stretch /stretch” and rerunning the build script in that chroot, instead of running it in Debian Sid (unstable). Now everything works fine. Lesson learned: Debian unstable is a too moving target for this kind of cross-platform development. The problem with unauthenticated packages is now fixed in the Github repo. Could not find any kernel-image nor initrd-file in the new built sys. No error-messages from your script. But found there some CROSS-statements. How to handle this? and rebuilt the system, but same result. No ssh open, no logs in /var. The repository ‘http://ftp.debian.org/debian stretch Release’ is not signed. and some more such errors, overridden with –allow-unauthenticated to get a complete run. Above I give exact kernel/firmware/uboot git revision hashes. With newer/older revisions you’ll likely run into problems. Also compare checksums of the kernel, uboot and firmware files on the SD card and on the host system. Low quality SD cards and SD card readers may corrupt files, as well as improper unmounting. Sorry, but could not handle or understand git revisions. Maybe, there is a problem. Will wait now for a ready-to-use image. Thanks for the howto. I was able to get (most) things working with some minor modifications ( –allow-unauthenticated for apt) and I think a “change directory (cd) command”. Nevertheless, bravo and thanks for the detailed tutorial. I’ve got both an rpi2 and rpi3, but I’m currently attempting to get all the functionality on the rpi3 going. I’m still unable to get the VC4 driver working. I see plenty of commentary on the internet about configuring an overlay in /boot/config.txt. Did you have to set anything in /boot/config.txt? No, I didn’t have to add anything to config.txt. Only “avoid_warnings=2” is set on both Rpi2 and Rpi3. Make sure you check out the above quoted kernel, firmware and u-boot git revisions/hashes since I haven’t tested with any other revision since I wrote this article. VC4 should just work out of the box because it’s integrated into the upstream kernel. It’s showing me an error. please tell me where did this /image/stretch ……. Is ?? This is relative to the workspace/rpi23-gen-image directory. 2) I just can’t get the kernel to recognise the sound HW. Did you do anything more than setting ‘CONFIG_SND_BCM2835_SOC_I2S’ to ‘y’? It’s best to stick to the kernel revision I’ve specified. And I never tried the sound HW. You’re awesome! It worked, but only after i’ve added “–allow-unauthenticated” to the script ( gona fix keyring issue maybe, the proper way). Any thoughts on how to boot kernel from apt repo via u-boot? Best scenario i see here is just trigger u-boot configuration generator (mkimage) after kernel update. That way i could easily compile new drivers on Pi directly. hi, wonder whether also a simple boot from USB-Stick (https://www.debian.org/distrib/netinst) will give the chance to install Debian on Raspberry Pi 3? No. According to my knowledge, the Raspberry cannot boot from USB. Also, Debian doesn’t yet provide an installer for the Raspberry. just curious: debian has an official aarch64 port. Can’t i just take the kernel from there without compiling it using your instructions? thank you for the awesome guide. I don’t know if the official Debian kernel works. Maybe try it and report back here? Glad my tutorial was useful! Thanks for your very detailed write up on how to get a raspberry pi 3 working with default debian. I am having trouble with getting the image to load the kernel. I have gotten the pi to boot from the sd card but it stops on “starting kernel …” and there is no further output through the hdmi and it doesn’t get an IP address so I am assuming that the system isn’t booting and the ACT light doesn’t do anything more once it stops at “starting kernel …” so I that is further evidence that it isn’t booting into a a full system. I am very confident that the sd card is fine since I can get it to work with the regular raspbian image, and I have tried 2 different sd card readers to write the image so I am very confident that it isn’t a corrupted sd card image. I have tried doing the default .config that is output from the gui kernel config tool, using just the “working-rpi3-linux-config.txt” just using that with the name changed to “.config” which results in me having to answer more config questions. I have tried loading the “working-rpi3-linux-config.txt” into the gui kernel tool and then writing it with the changes. That doesn’t work either. On one test with the modified “working-rpi3-linux-config.txt” output from the kernel config gui and kernel 4.9.78 It would get to “starting Kernel…” and restart 1 second after stopping there, and continued till I pulled the power, and would do that again if I plugged the power back in. The ARMv6 or ARMv7 in Raspberry Pi and Pi 2 are bi-endian (supporting both big-endian and little-endian byte order). All the pre-built GNU/Linux distributions for the Raspberry Pi are little-endian. I have some code that I would like to test in big-endian mode, and I was wondering if you could give some advice how to modify your recipe. Is there any Debian armeb packages that could be useful in bootstrapping the userspace? According to https://raspberrypi.stackexchange.com/questions/7279/big-endian-distribution-for-the-raspberry-pi it is possible to build the kernel in either mode, but the bootloader would have to be adjusted before starting the kernel. With uboot, I guess it should not be a problem to insert a SETEND instruction somewhere. And I guess the instruction could also be inserted at the start of the kernel boot routine. It’s an interesting question. Unfortunately, I don’t know enough about it.